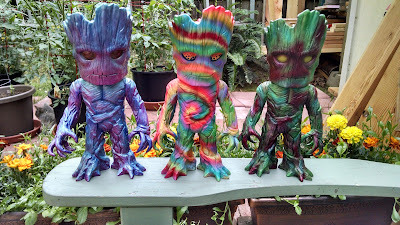 I'll be putting my three custom Groots up for sale in the Shop, this coming Friday at 12:00PM Pacific time. Each one will include the original box, tag, and card. Shipping is free in the US, $20 international. 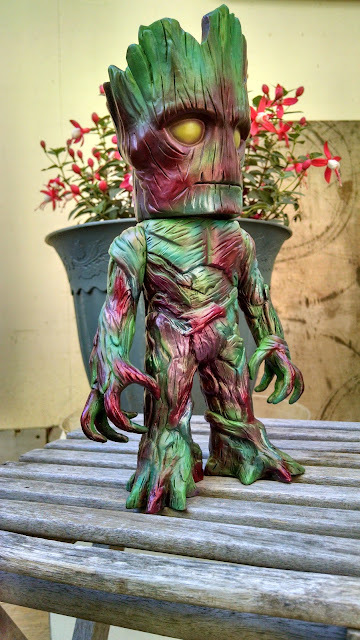 Groovy Groot will be $200, due to the amount of paint, and the re-sculpted mouth. 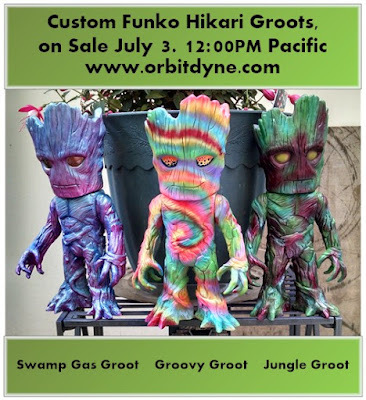 Swamp Gas Groot and Jungle Groot will be $100 each. 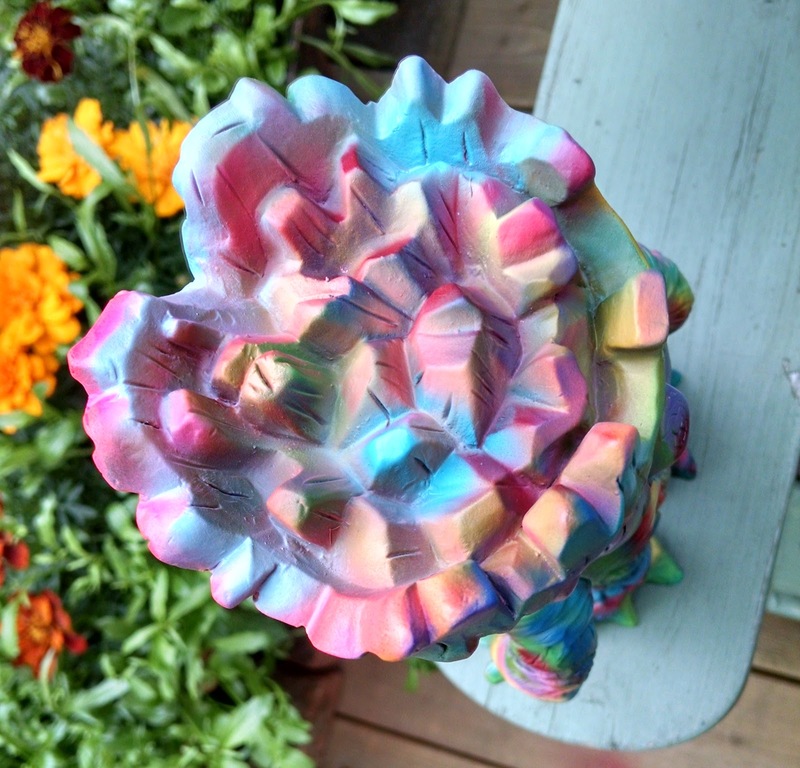 Each is one of a kind, and pretty nifty. I've been wanting to do a tie-dye styled design for a while, and Groot seemed like a good candidate! 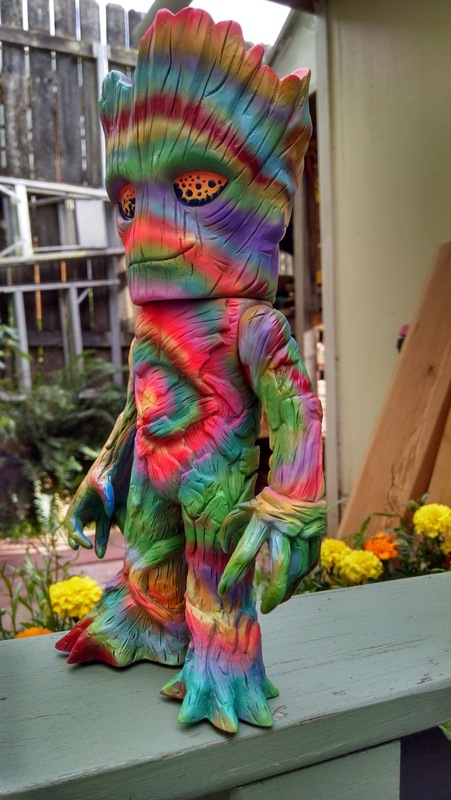 With my now-smiling groot, I set to work with Monster Kolor solids, trying to replicate a tie-dye spiral. 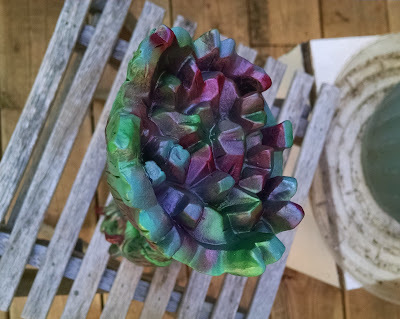 It was a challenge selecting colors that would contrast (and clash!) just right, without looking too out of place. I may have overdone it with the red. There are around a dozen colors in swirls, no metallics, since the bold colors would be contrast enough. I finished the eyes with Jack Kirby-style space bubbles (lava-lamps?) he ended up looking like the wildest dish of Rainbow Sherbet ever. I'm out of Hikari Groot figures to paint, but not out of ideas, and I'll probably buy a few more in the future. Funko was kind enough to pick this one up on it's Instagram, where it's gotten a little attention! I gushed all over the Funko Hikari Groot toy in my last post. Sufficed to say, after one, I was jazzed to paint more. I was reserved with the metallics on Jungle Groot, this time, I cut loose! 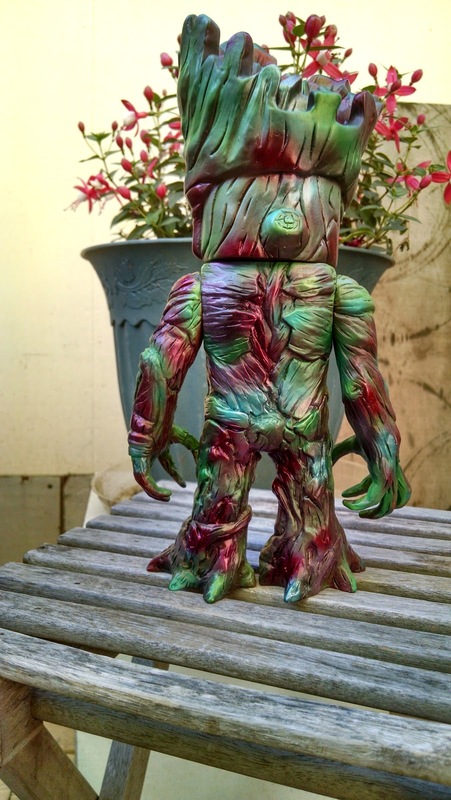 Again inspired by Kenner's Swamp thing toys, I wanted a heavy contrast between colors and surfaces. 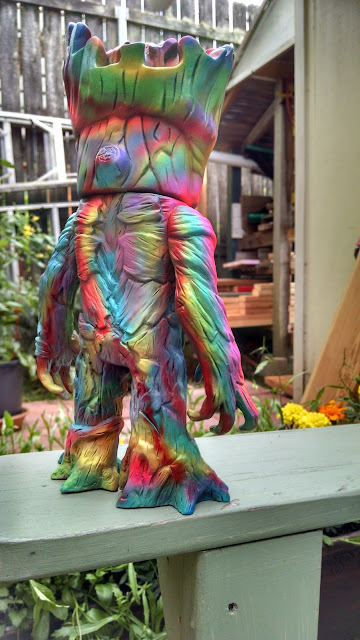 Monster Kolor blues and magenta came through again, pricinding a glowing, otherworldly look. 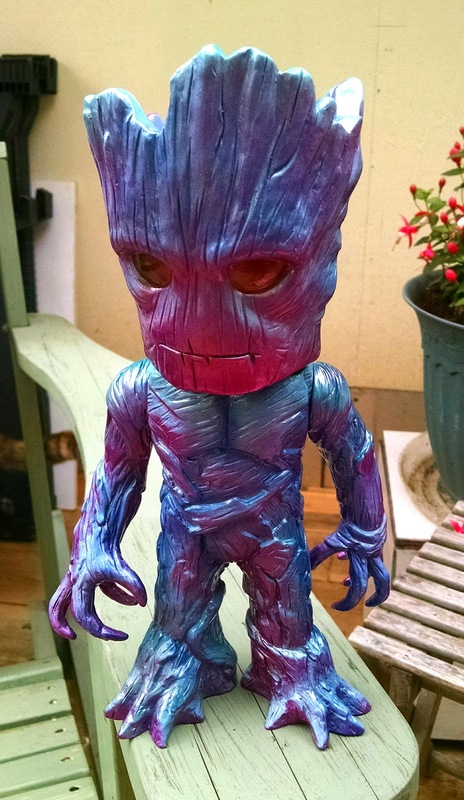 Copper eyes, pink pearl, and high-gloss clear-coat complete the piece, and there's some cool chiaroscuro effects depending on your viewing angle. 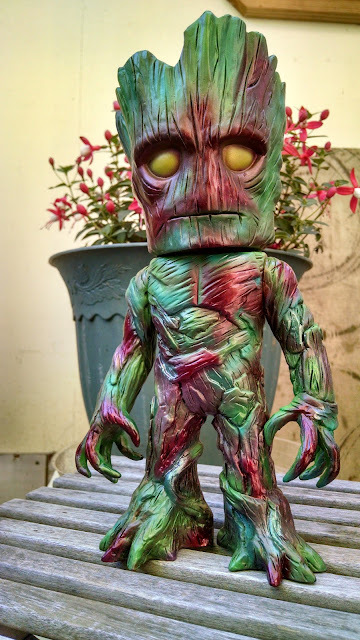 I really like Funko's Hikari Groot toy. 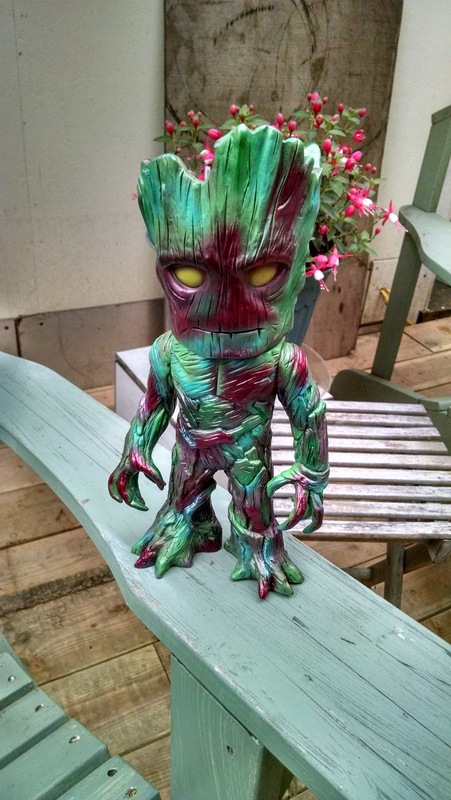 It's big and hefty, nearly 12" tall, has good proportions, and very nice detail work throughout. If you've considered getting a Funko Hikari figure, this is a great place to start. It's not "proper" Japanese Sofubi, despite what the box may say, but the quality is top notch. I had to paint it, and went all getting three of the standard figure (which, again, looks really nice). I wanted something more colorful. 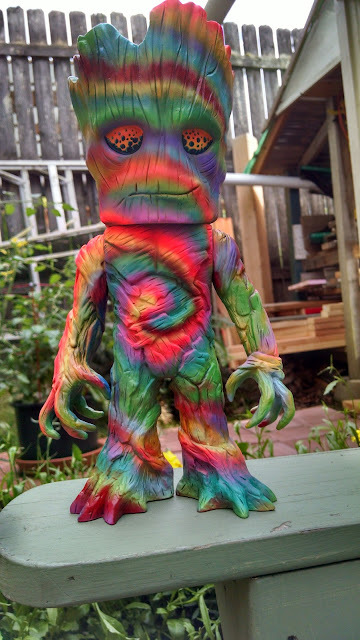 Inspiration comes from Kenner's wild 1980's Swamp Thing toys. While I never had any as a kid (too scary!) they fascinated me then, and their bizzaro schemes are still a great place to start. 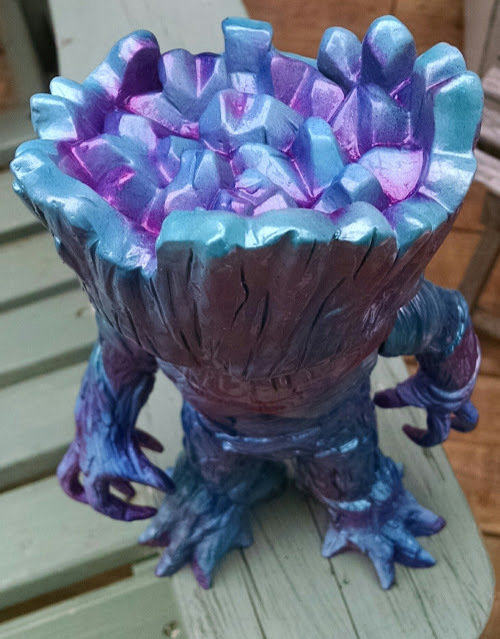 Using Monster Kolor, I sprayed both solid colors and metallics at different angles to highlight the details. Unusually for me, I skipped the pearl effects and high-gloss clearcoat. That leaves the constrast between the satiny solid greens and teals, and the glossy metallic red and green highlights. His eyes stand out with metallic yellow. I had a great time getting into all the little details of the figure, and I hope you all enjoy it too!